Residents of towns along the frontline in eastern Ukraine have been living in constant fear ever since full-scale fighting resumed there. RT’s Roman Kosarev has spoken to those trying to survive in the very heart of the conflict zone. 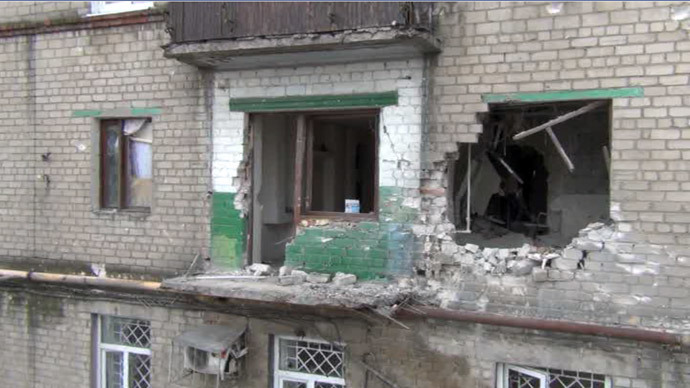 Six people have died and 12 were injured in Gorlovka, Donetsk Region, this week alone, the town’s website says. The local healthcare statistics say the overall Gorlovka death toll in the conflict has been 115 civilians, 17 children among them. Now that several months of relative respite are over, those who had nowhere to flee from the war-torn area, are once again adjusting themselves to the sounds of artillery fire – a signal to quickly run and hide in the nearest basement. The situation in places like Gorlovka was on Wednesday described as “awful” by the International Committee of the Red Cross (ICRC), which once again called on the warring parties to show respect for civilian lives. Among those trying to bring life back to normal against all odds is Vladimir, a repair worker. Every time a building gets damaged in shelling he and his crew are there, trying to bring essential services, like electricity and heating, back to functioning. Repair crews are working round the clock and regularly come under fire. Shelling or no shelling, Gorlovka residents with serious illnesses, have to get their life-saving treatment. When the RT crew visited the hospital it was receiving humanitarian aid from Russia, including items necessary for kidney dialysis. There are now 40 people in the town in need of the service provided three times a week. A trip to the hospital, however, is now seen as a double attempt at survival by the patients, fearing artillery strikes as well as medical resources shortage.